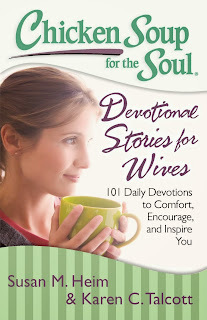 Chicken Soup for the Soul: Devotional Stories for Wives – 101 Daily Devotions to Comfort, Encourage, and Inspire You by Susan M. Heim and Karen C. Talcott is primarily geared towards married women but I’m sure that anyone in a committed relationship can benefit from these stories. The stories and prayers that I really identify with are in the chapter “Facing Our Challenges Together”. While my husband and I haven’t gone through all of these tragedies/difficulties, we have had our fair share of difficulties. We have suffered the loss of family members, financial difficulties, and health issues. One of the most difficult times was probably losing my husband’s brother. He passed away the week of our 10th anniversary. It was so sudden and he was so young. He passed away from complications due to Marfan’s, which my husband also has. It was a hard loss for everyone but it also scared us. We became more aware that my husband could die young and suddenly. His brother was 42 when he died, and his mom was 48. We know that his brother’s death was from the aorta dissecting from the heart, and think that the same thing happened to his mother. Marfan’s causes problems with connective tissues and the heart. We’ve dealt with a lot over the years. It still amazes me how we have managed to be steadfast, while so many others around us have separated or divorced. I know that I can always depend on him, no matter what happens. When I got sick, he was there and took care of everything – the kids, cleaning, cooking, working, etc. This is the perfect book for any wife/life partner. There is something for the young and old, and for those just married and those married for years. We can all learn something or just realize that we are not alone in our feelings. This book would make a wonderful wedding present or anniversary present. I highly recommend this book, Chicken Soup for the Soul: Devotional Stories for Wives – 101 Daily Devotions to Comfort, Encourage, and Inspire You. These books make great gifts, especially for those hard to buy for people. If you are not ready to purchase a copy, or you would like another copy for someone else, you can try to win one. Check out my giveaway post where I am giving away 3 copies of Chicken Soup for the Soul: Devotional Stories for Wives – 101 Daily Devotions to Comfort, Encourage, and Inspire You.